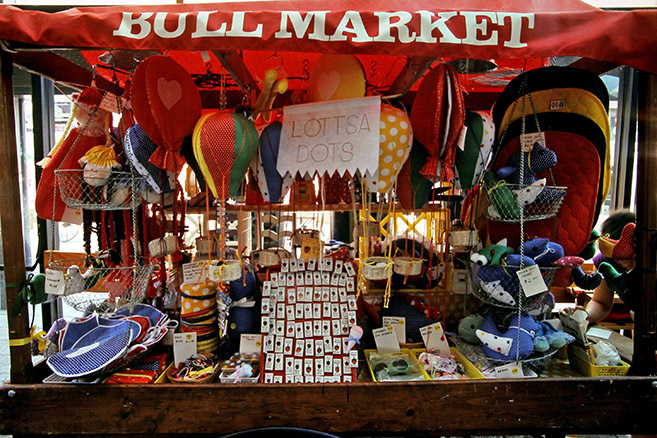 It is widely accepted that James Rouse and Benjamin Thompson built the first house of specialty retail when they renovated Faneuil Hall in Boston and created the first Festival Market. But, if that is true, then it was early cart merchants and entrepreneurs who moved in and made it their home. 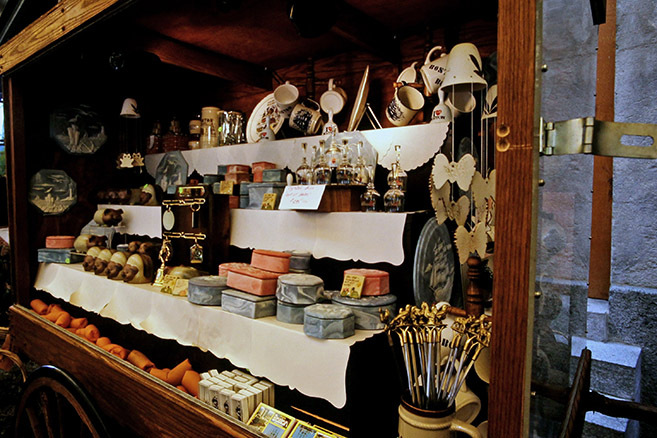 In many respects, early pushcart merchants were largely responsible for inventing specialty retail. 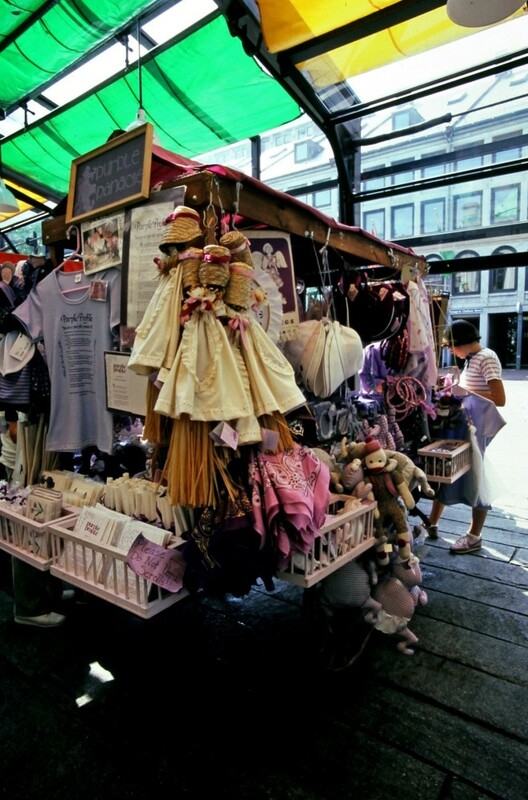 Consider that, at the time of Faneuil Hall’s opening, rules for successful cart concepts, visual merchandising, and business models didn’t exist. There were no experts to explain optimal price points, occupancy costs, and creative fixture design. Early merchants had to learn these critical rules by trial and error. Here at Shopworks, we use these rules to improve an RMU’s performance, usually with stunning results, and sometimes even overnight! Such is the power of these techniques. Still, despite their lack of experience, the early merchants were quite successful. After nearly four decades of success and growth in specialty retail, it is very interesting to look back at some early cart uses. In order to do this however, the task requires a bit of retail archaeology as no one, at the time, sought to document with any discipline, early cart programs, their successes and failures. Fortunately, the principal of Shopworks, Inc., Ms. Sharon Loeff, was there, in-person, and has provided images that are very interesting. In this second posting to Shopworks’ new blog, we will look back at some early cart uses to see what made them successful, and ask if the use would be relevant today. 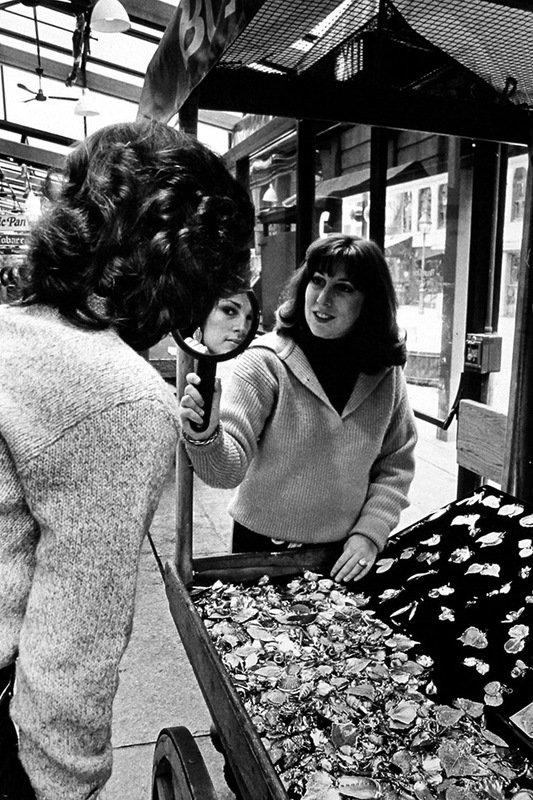 The image above shows an early Faneuil Hall cart merchandised with City of Boston branded merchandise, circa 1977. Would this be a viable cart concept today? Probably not, unless the retail location was historically, or geographically significant. While such goods are not usually found in a traditional developer’s common area program, this kind of merchandise is common in most major airports across the country, as anyone who has flown recently knows! 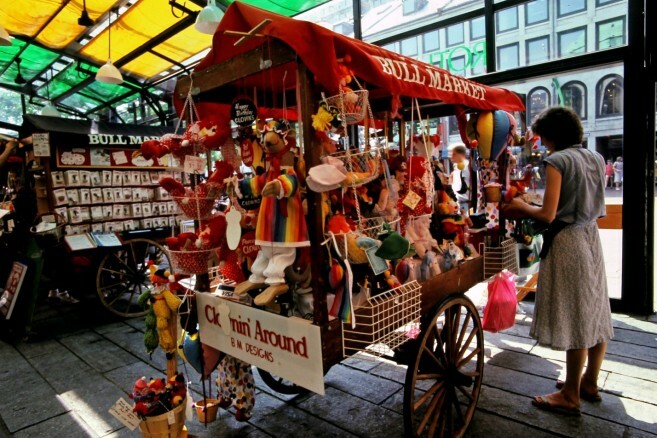 Some figures suggest that the Faneuil Hall Festival Market nearly doubled Boston’s tourist attendance in its first year of operation. Even if the numbers were a quarter of that estimate, branded Boston merchandise is the kind of gift ware that required little thought for someone who needed to bring home a memento of their trip. The image above shows what cart merchants have known for decades; a retail use that is playful, imaginative, and even a bit silly can be successful. Well-priced, fun, and attractive merchandise tied together in a theme almost always creates successful results. In today’s world of homogeneous, knock-off, and look-alike products, would this concept work? Probably not as shown here-but, with care given to product selection, thematic visual merchandising, and good pricing, such a retail use could be do very well. There are many derivatives of this concept in use today that have origins traceable back to this approach. ITS SUGAR, for instance, is a permanent retail use combining confections with fun gift items under one brand. Here is an early cart concept called Nature’s Jewelry (manned by an early version of our founder, Sharon Loeff). While the concept is not on carts today, it remains prolific with online merchants from ESTY to Amazon. The idea is simple: take a real plant leaf and coat is with a thin film of precious metal such as gold or silver to make ornamental jewelry. At the time this photo was taken, the price points were $4.99 for a necklace pendant, and $9.99 for a pair of earrings. This retail concept was extremely successful. With a proper makeover, it could no doubt, be successful again in today’s market. Given improvements in manufacturing methods and the ever increasing interest in natural, organic materials, shapes, and textures, there are tremendous possibilities. Better still, merchandise need not be limited exclusively to plated foliage, but could include any natural specimen. This cart concept featured a variety of playful and colorful merchandise patterned after a clown motif. The merchandise was unique, original, and more likely than not, handmade. There is certainly a market for this kind of merchandise today, but prolific, low cost plush toys in every shape, size, and color have obsoleted many classes of dolls and stuffed animals that were very successful in their day. The cart shown above is called Purple Panache for obvious reasons. The use tied disparate and otherwise unrelated merchandise together under one brand. It appears that the merchant had only a few criteria for inclusion: clever and innovative products with a low price, and containing a shade of purple! Color branding remains conspicuously in in use today. E.G. Pink logo clothing, White House, Black Market, etc. Keys to successful execution of this kind of cart concept are; well thought out product selection combined with careful product placement and visual merchandising. Modern experts in specialty retail are very effective in these areas today. At the time that this cart began operating, merchants were still learning the rules for success with these techniques. Here is a cart entirely devoted to stamps and accessories. Stamps, like wax seals, remain very popular today as fun, personal gift items. Decorative and personal stamps range from hand-made craftwork, to mass produced commodities. 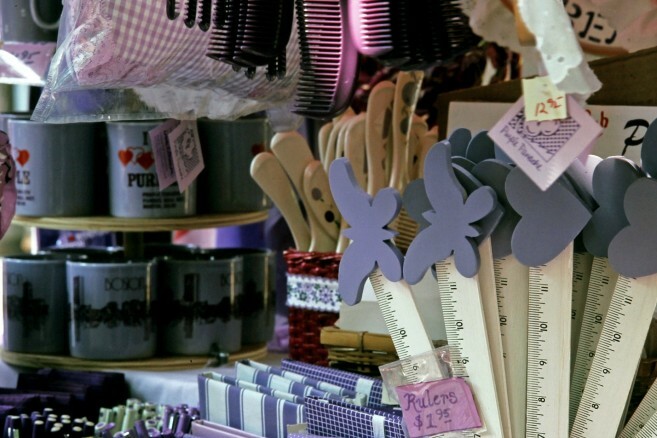 The category remains popular with online retailers, stationers, and gift boutiques. Materials used to make stamps include metal, carved stone, and rubber to name a few. They remain relevant because stamps can embody so many different themes; culture and nationality, spirituality, environmentalism, etc. This cart at Faneuil Hall was very successful. The merchandise provided a unique way to give a personalized, thoughtful, yet inexpensive gift. With some creative innovation and re-invention, a stamp cart could be a hit in a common area program today. These cart images show the resourcefulness and innovation of early cart operators. Much of what they discovered are now standardized rules for successful operation of an RMU business. In future posts, we will look at some these rules and their application.